Lily flowers are in the genus Lilium, which has 100 species of perennial bulbs known for their striking, fragrant flowers. The flower shapes on lilies range in form from trumpet and bowl to funnel and recurved. Lilies bloom from spring to fall, depending upon the variety, and are ideal grown in containers, perennial gardens or tucked into containers to nestle around the landscape. Most lilies require well-drained, nutrient-rich soil that is acidic to neutral, although some lilies require alkaline soil. Star Gazer lily (Lilium "Star Gazer") is a perennial bulb with a moderate growth rate. The fragrant, large, upward facing, funnel-shaped crimson to pink flower are speckled with purple spots and have dark edges. Star gazer lilies grow 3 to 6 feet tall and emerge in summer to light up the landscape with color. Star gazer lilies have strong, deep green stems and foliage that are ideal planted along borders or grown within containers. They require full sun to part shade and deep, well-drained soil. They thrive when their flowerhead is located in full sun and their feet in shade. 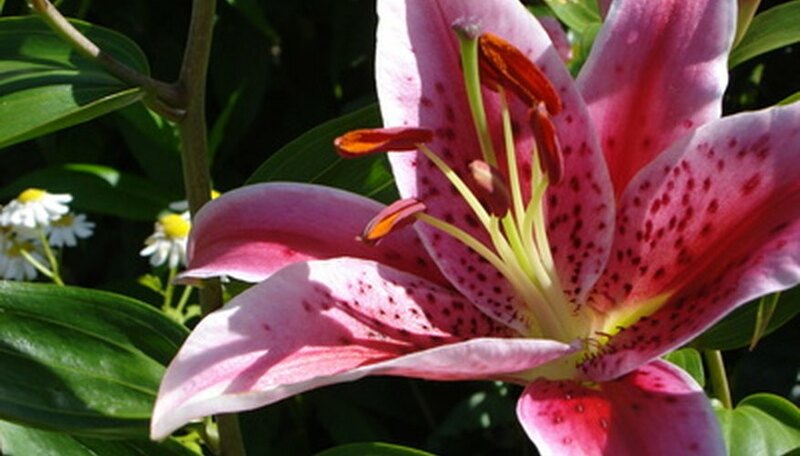 Grow star gazer lilies in USDA zones 3 to 8. Formosa lily (Lilium formosanum ) is a variety of lily flower that blooms from late August until early October. They grow 3 to 6 feet tall and are ideal lining the back of a bed for height. The fragrant, 10-inch-long, white to pink trumpet-shaped flowers bloom up to eight flowers per stem. After the Formosa lily fades, the stalks open upward to dry the seeds within, creating a candelabra-like shape that looks striking within a winter garden or cut and used in a dry flower arrangement. Formosa lilies thrive in full sun to shade and can be grown in pots, as well as in the ground. Plant formosa lilies in USDA zones 6 to 9. African lily (Agapanthus), also called lily of the Nile, is a summer-blooming perennial bulb that grows 12 to 60 inches tall. The clusters of trumpet-shaped flowers grow in a wide range of colors including, blue, pink, violet and white and attract butterflies to the garden. The erect, tall, deep green stems on African lilies hold one bloom per stalk. The long, strap-shaped leaves on African lilies are deep green to contrast with the bright blooms and grow up to 12 inches long. African lilies grow best in full sun and well-drained, moist soil. They grow best in USDA zones 4 to 11.